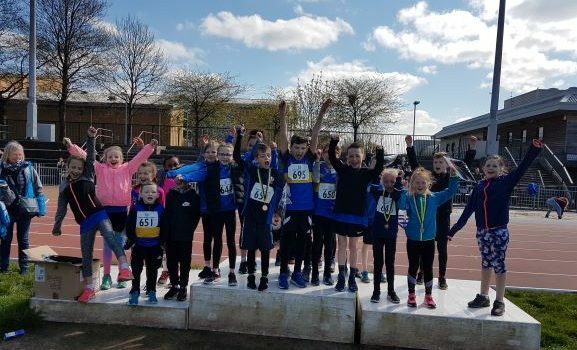 Saturday saw the first Track and Field Event of the 2019 Summer Season with the Young Athletes Track and Field Club Championships at Crownpoint. With a record entry there was some great competition. The Under 11’s competed over the 100m, Long Jump, 600m and the Shot. The Under 11 Girls saw Guinevere Ofeogbu go one better than 2018 to pick up the 2019 title. For 2nd and 3rd place saw a very close fight with Imogen Millar picking up the silver medal by 1 point from Alicja Taborek. In the Under 9 event Eva Porteous was 1st with Jessica Taylor winning the silver medal and the bronze medal went to Saffron Robertson. For the older age groups they competed over the 100m, Long Jump, 800m, Shot, Hurdles and High Jump. Violet Campbell also did one better than 2018 and this time won the 2019 Under 13 Girls title, Katie Woods picked up the silver medal with Emma Leiper finished in the bronze medal position. Not to be outdone by his sister, Ethan Ofeogbu performed well in the Under 13 Boys event to pick up the title. The 2nd and 3rd places went right down to the last event, the 800m, with Matthew Fox pulling ahead of Callum Thomson to pick up 2nd place and Callum in 3rd place. The Under 15 Girls title was won by Leah McCluskey with Shannon Monaghan picking up 2nd place and Jessica Grant finishing in 3rd place. Michael Conteh was the Under 15 title winner with Ruaridh Campbell in 2nd and Maynard Conteh in 3rd. Alexia Adelabu was the Under 17 Women champion. Check out now you got on at the following link – Full Results 2019 and see 2018 results. A HUGE BIG THANK YOU to all the club members and parents who volunteered to help, our sport in run by people who give up their free time, without them they would be no events. Also thank you to the staff at Crownpoint for all their help.